Midwest Brigadoon now available for sale. 113 W. Island Ave. B. Please include your full mailing address, email address and phone number. Allow 10 days for shipping. For most of the year, the 320 acres of the Minnesota State Fairgrounds stays pretty quiet. But at the end of every summer, for just 12 days, 1.8 million people from around the world pack into this place. They eat, they play, they dance, they sing. And just as quickly, they head back out, and it’s quiet again, for another 353 days. Midwest Brigadoon tells the story of this place, this event, this city that emerges from nothing, to abundance, to nothing again, documenting the odd spectacle of this uniquely American experience through poetic visuals by Ochen Kaylan and meditative score by Leslie Ball. Midwest Brigadoon was filmed at the Minnesota State Fairgrounds in St. Paul, Minnesota, before, during, and after the 2010 Minnesota State Fair. 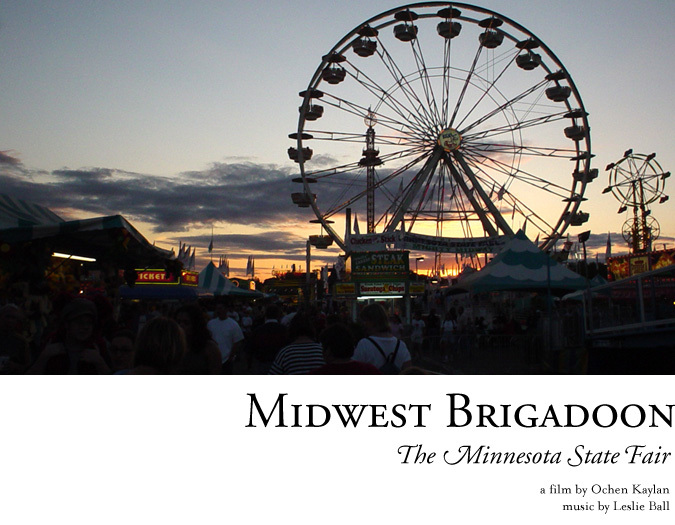 Midwest Brigadoon is by Ochen Kaylan with music by Leslie Ball. Supporting producers: Bruce Abbott, Gail Anderson, Bob and Lee Ball, Paulino Brener, Phyllis Kahn, Norah Long, Daren Mehl, Rita Meyer, Joseph Voelbel, Jann Cather Weaver. Thank you: The Minnesota State Fair, Robin Goldstein, Renee Pearson, Kickstarter, Moni Francesca. And thank you to: Silvi Alcivar, Brian Arndt, Erika Loen Beatty, Ginny Belden-Charles, Jim Bickal, Lana Bolin, Stephen Borer, Jeanne Burns, Cindy Pitou Burton, Suzanne Pekow Carlson, Chad, Barry Clegg, Kelli Clement, Peter Clowney, Matt Cohen, Kate Ellis, Connie Evingson, Cynthia French, Jessica Fried, John Gaspard, Jeffery Gauss, Irene Genelin, Alex Goldfarb, Joan Guettler, Ellen Guettler, Mitch Hanley, Sarah Heller, Craig Hergert, Lisa Hondros, Gary Hopkins, Ari Hoptman, Valerie Kahler, Lois Kaplan, Barbara Anne Keely, Kay Kirscht, Brian Lebakken, Andrew Lee, Mike Lougee, Catherine and Dan Mandle, Jerry Martin, Maryn McKenna, Jacob McKnite, Dave Meyer, Libby Obrien, Kate Pabst, Scott Pakudaitis, Michael Raphael, Nicole Reynolds, Steve Rosenberg, Laurie Salmela, Chris Schlichting, Barbara Shelton, Chris Shillock, Jeffrey Siegel, Michael Skoler, Stephen Smith, Brian Sostek, Laurie Stern, Peter Strom, Mary Strupeck, Sheila Sullivan, Pete Thomas, Elizabeth Doherty Thomas, Nancy Whittlesey, and Ann Drew Yu. Copyright © 2011 Ochen K.